Of the many demons occupying hell, few wield as much power as Adramelech. According to the Old Testament, Adramelech (meaning “King of Fire”) was one half of Assyrian city of Sepharvaim’s pantheon of gods-- a duo that also included the goddess Anammelech (meaning “Anu is King”). Worshippers of these two were feared and reviled for their practice of burning their children alive as part of a horrific ritual sacrifice. In modern demonology, Adramelech usually takes the form of a donkey or a peacock-- or some combination of the two. He is said to be one of the ten archdemons presiding over hell, and the eighth member of Beelzebub's "Order of the Fly." According to Collin de Plancy’s Dictionnaire Infernal, Adramelech also wields considerable influence within the infernal chambers of power. Not only is he the President of the Senate of Demons, but he is also Chancellor of Hell, and, if Plancy is to be believed, in charge of Satan’s personal wardrobe. Revelation 9:11 (protestant Bible-Amplified version): "Over them as king they have the angel of the Abyss (of the bottomless pit). In Hebrew his name is Abaddon [destruction], but in Greek he is called Apollyon [destroyer]." The Old Testament was written primarily in the Hebrew language; while the New Testament was written in Greek. Wikipedia states that Abaddon could be considered, rather than as an individual, but instead a place where lost souls now reside. According to them, the 18th century theologian Matthew Henry thought Abaddon to be the coming Antichrist. Whereas other commentators from the 1800s and 1900s saw him possibly being Satan himself. Abaddon is a name on the other hand seemingly for a location (such as hades, or hell) no less than six times in the Old Testament (books of Job, Psalms, and Proverbs). This seems to refer more to a place, not a being like an angel or demon. According to the Bible study website gotquestions.org he, one of Satan's generals, will one day come to wreak havoc on the people of the earth, as part of God's final judgment on mankind. There are a lot of people that may wonder what the exact definition of wickedness is according to the bible. The truth of the matter is that the Bible defines this in a number of ways and each version of the bible or other religious texts that you consider holy have a different version of this. This is a discussion that could fill a book and maybe one day we will get there, but for the purposes of now, we are just going to focus on a single article that will help to narrow this down a little. So let’s dive right into this subject and get started on this discussion as to what is and is not considered to be wicked according to the bible. The first thing we need to break down is the fact that the Bible, in a nutshell, describes this as anyone who commits a crime that according to the Bible is worthy of being punished. This is a very broad definition that really needs to be narrowed down a little to get a more clear picture as to what exactly does and does not constitute the definition of being wicked. The reason that this constitutes someone being wicked is due to the fact that it is a crime that is against God and in effect all crime is looked at as being against God. Greeks tend to have a bit of a twist on this definition as they have a word that tends to translate to malice. This, in turn, means that a crime that was done with malice is more in line with what a person that is looked at as being wicked. This is a more defined definition and as such many people tend to take the Greek definition a little more to heart. No matter where you look in the bible, you are bound to find areas that show wickedness in all forms. Too many times people want to try and take these definitions and tweak them to fit their particular needs regardless of what you think the definition is, there are those that say that any sin that is committed regardless of if it was done with malice or not is looked at as being a sin and as such the person that committed the sin is looked at as being wicked. This can cause a lot of people to be very confused and as such can often time lead to a person having to have a serious talk with their priest to get a little clarification regarding this subject. Wickedness has a lot of meanings and a lot of interpretations that are spread across a multitude of different countries as well as different cultures. The main thing that you need to stay focused and let things sort themselves out and not worry about what is and is not considered to be wicked. Chances are that if you live your life according to the bible, you will find that wickedness just seems to not be in your life. So you find yourself possessed by a demon. This is more than likely not how you planned to spend your weekend. This can be a time of distress for you and if you are smart about how to get rid of the demon, you can take back your life. Before you can get rid of the demon, you need to make sure that you know the signs that you are possessed. These can sometimes be obvious and other times not so obvious. The key is being able to recognize these signs and knowing how to deal with them once they take root. So before we get to vanquishing any demons, let's take a moment and discover what it is that has led to you being possessed. The first thing you need to do is look for sudden changes n you or your environment. If you are a positive person most of the time, then all of a sudden you begin to be in a dark place, then BAM demon. Or if there are noises you can explain or smells that you don’t know the origin of then again demon. The first thing you can do is to call a priest that may come out and try to bless your house. This is in the event that the house is what is possessed. If it is a person that has been possessed, then you might have to take a few additional steps. The whole Catholic Priest and demon thing can get a bit sticky. If you have something in your home that you think may be the center point of the demon, then you will want to make sure that you get rid of it. No matter what the emotional connection to it is, you will need to vanquish it from your home. Often times a demon will take residence in this item since it holds s close part of your heart. Getting rid of it will be a good first step that you can take to get past the demon. Cleaning your area can help to make the demon feel that it is not welcome. Also if you are the one that is possessed, then you need to make sure that you do not let the negative thoughts win. Get yourself mentally in a good place and go from there. Smudging is a practice that many people will generally use. Another method is the use of incense to help and provoke the demon to leave your home. These are a couple of ways that you can make a demon go away and help your home to go back to the peace and quiet you used to enjoy. Even if you don’t think you are possessed or your home is, these are excellent ideas that will help you to get ahead of any demons that may be looking to settle into your home. The better prepared that you are for this, then the better you will be able to battle these demons and get them out of your life. sage is extremely powerful for getting rid of demons and evil presences. To sage smudge your home or just a room, purchase a bundle of natural sage. Once it arrives, say a small prayer and light the sage. It will start smoking. Walk about the edges of the room, paying particular attention to any areas where you have seen or felt a demonic or evil presence. While you are sage smudging, you can pray, call to the Lord and demand the demon leave. Evil entities plague our world, both physically and spiritually, often attacking those whom are weak and frail. These entities are known by many names, Hell Spawn, Devils, Evil spirits, Child of the devil, and of course the well known terminology Demon. These entities are often associated with bad luck and death, more commonly thought of to posses people. Demons are pure evil, no good can come from bumping into one, they are tricksters and will play with your mind. They have been known to make promises to benefit people but the circumstances are often though of as a sort of double edge sword, often implying a form of harm in the form of a wish. There are several steps people can take to recognize demons and stay away from them. Step 1: Look for signs in an individual that are uncommon for their character, for instance, those whom go to church on a regular basis but are now avoiding any spiritual places like they are the plague, might be possessed or influenced by a Demon. Step 2: Individuals whom emotional status has changed drastically, If someone is well known for having a happy-go-lucky attitude and can brighten up a room with their smile suddenly takes on a darker demeanor and seemingly void of emotion, might be possessed by a demon. Step 3: Individuals with a drug or drinking problem, those individuals are often said to be struggling with personal demons and this may very well be the case. Demons can attatch themselves to us and exert unusual behavior which can take the form of addiction dependency. Step 4: If you feel a sinister presence in your home or around you, it might be a demon. Demons have the ability to effect the natural world in negative ways, people often report that the air feels thicker, almost like they are breathing in water. Feeling empty inside and void of empathy might also be a sign that a demon has attached itself onto your person or property. Step 5: Hearing voices can be a sign of demon interacture as well, these voices may some soothing at times but can take a darker turn and can include suicidal thoughts or willingness to harm oneself or others. Step 6: These demons can also cause severe night terrors, these are worse the nightmares, they often feel like real life and the effects can be deadly if a person has a weakened heart or body. For those who don’t know, I started my publishing journey with submissions to agents. By the time I finished, I had submitted to over 450 agents and had gotten back hundreds of rejection letters. In the end, it was a huge waste of my time, and there were numerous reasons that I stopped. 1. I finished my lists. That’s right. I put together several lists of agents. List 1 was agents I felt would be a good fit for my work, and their work ethics seemed to match my own. List 2 was agents that I felt could do a good job working with me to get my manuscript to the best possible traditional publisher, but I wasn’t sure about their work ethics or if they were super goal oriented. List 3 were agents that were professional and had been in business for a while, and there were no red flags anywhere online. Now, to put together those lists took a lot of time. I viewed a lot of agent websites and a lot of supplemental agent websites. I was very thorough with my research. 2. If I had put together a List 4, it would have been agents I wasn’t confident about. They either didn’t have websites, had spotty success records, had actual complaints against them or submitted to publishers that don’t require agents! AKA: I could have submitted myself to the same places where they were submitting books. That’s not helpful! 3. I didn’t feel like the agents weren’t reading my submissions materials or taking me seriously. I’m a very serious person. I take my writing seriously, and I am very goal oriented. I felt like some of the places I submitted to had a very LaDeDa attitude. That doesn't fly with me. 4. I felt like more than one agent clicked “select all” DELETE with their email inboxes in order to immediately clear them. 5. I felt like I was the only one taking this seriously. Publishing is a very serious business, and when you are an agent, you need new books to keep your income going. Right? Like I need to sell books to maintain my income, they need to acquire new talent in order to maintain and/or increase theirs. Again, I just felt like the work ethic wasn’t there. 6. I felt like some of them were reading a 20 year old script on what types of books to take and what to auto-reject. 7. At the end of a year and a half of submissions, the timeline was no longer working for me. I hadn’t found a working, serious agent after 18 months, and there was no telling when I was going to find that agent. Even if I had found one the very next day, I could expect another 4 months of editing, 6 to 12 months of finding a publisher, 2 or 3 months more of editing and 12 more months till the book was released. It was too much time. Maybe if I had started the submission process when I was 10, that timeline would be ok.
After carefully evaluating the process, my own goals, my timelines and everything else I had planned and wanted to accomplish as a writer, the traditional route was not going to work for me. In fact, I’m not sure it would have ever worked for me long-term even if I had found that agent right away. Baal is also often called Bael or even Beelzebub or Beelzebul. Baal was often said to have appeared in the form of either a man, cat, toad, or a combination of the three. Collin de Plancy's 1818 book “Dictionnaire Infernal”, the heads of the three creatures were placed onto spider legs. In demonology, Baal is said to be the first and principal of the seven princes of hell. He has also been referred to as a king, since his name means “master” or “lord.” Baal was the chief god of the Caananites; a god of rain, dew, and fertile fields who rode on the clouds. But, his name came to later be associated with other deities. The name Baal often came to refer to a combination of many local deities that were the patrons of different cities through Asia Minor and the Levant. At times, the name Baal was even used for any high-ranking demon or even Satan himself in some Christian writings. Baal worship features prominently of the Book of Judges. After the death of the famous Israelite leader Joshua, best known for the Battle of Jericho, Israel went back and forth between worshiping the Lord and local deities. Chief among these was Baal, although there were others, as well. The Lord would eventually “punish” the Israelites for this idol worship by forsaking them and letting them be captured by the Assyrians and Jerusalem was destroyed. Baal, or Beelzebub, has become very much a part of popular culture. There are books, comics, movies, television shows, and video games that all depict him as a character in one way or another. For example, the classic book “Lord of the Flies” directly refers to Beelzebub. 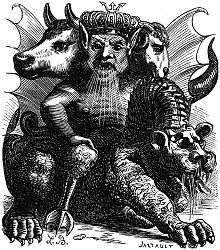 Baal is top demon of Goetia. In astrology, the zodiac position is 0-4 degrees of Aries. The tarot card often associated with Baal is the 2 of Rods (From Azazel). The associating planet is the sun. His rank is king. Baal is a day demon of the fire element and rules over 66 legions of spirits. In magick, Baal’s metal is iron, his plant is the fern and the candle color is black. Demonology: Who Was Cain's Wife? Cain’s wife is an interesting figure in the Bible mainly due to the fact that it’s unclear what her name was and exactly who she was. All that’s really known about her is that she bore Cain a son after he was exiled to the Land of Nod. In other Christian writings, however, she is often referred to by the name of Awan (or Aven). In the Bible, the Land of Nod is not a physical place, although it is said to be “east of Eden”. The word “nod” is actually a Hebrew verb that means “to wander”. Essentially, being in the Land of Nod actually means that you are a nomad. People were often nomadic in those days so that wasn't necessarily considered a bad thing. However, that would eventually change as Cain and his descendants would establish a city there. Wherever it was, it was in the Land of Nod that Cain’s wife bore Cain’s son Enoch. Enoch is a very important person in the bible, which is why Cain’s wife is so important. However, Cain’s son Enoch is not the famous prophet Enoch. This Enoch was important because of the city that is named after him. Whether he built it himself or Cain by it in his name is unclear in the Bible. But for that alone, Cain's son Enoch is notable. Enoch and his descendants would end up growing this city. However, this City of Enoch would not be the same City of Enoch that would later see its inhabitants disappear after the prophet Enoch was taken into heaven by God. However, they are related, just not the same person. Was Cain’s Wife Also His Sister? It was common in the days of Genesis for people to marry their relatives. Cousins and even siblings often married in order to have children and grow the family. This was considered a completely normal practice in those days, as the world's population of humans was so small. So, whatever her name may have been, she was likely his sister.